Cage free, pasture-raised, organic…what does it all mean?! The eggs in the large photo above and the photo to the left are farm fresh, local, pasture raised eggs. 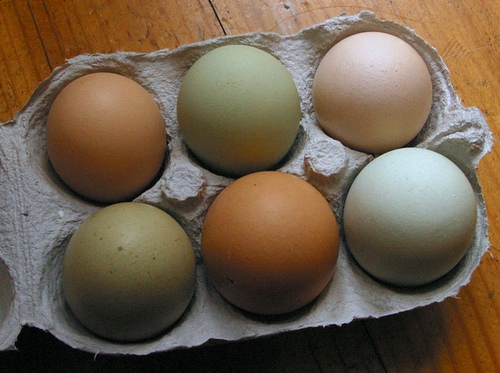 These babies come in all different colors based on which type of hen laid them! Some people may have one type of hen while others may have multiple different breeds, which is why there could be one color or multiple colors. These are the BEST possible eggs that you can buy.Just check out these pictures that show the difference in the yolk colors; that speaks for itself! So….WHY are these the best eggs? 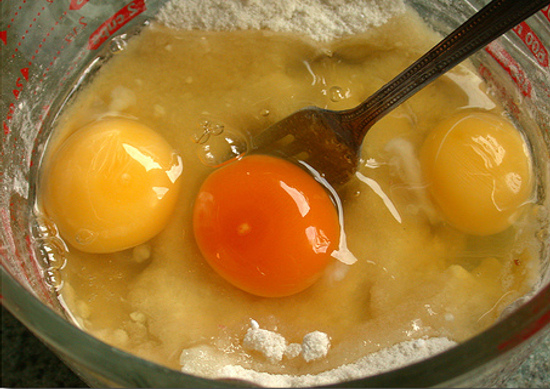 Why is the yolk such a different color? First of all, LOCAL is the best way to go because you are able to support local farmers, your eggs will be fresh and straight from the farm, and you can talk to your farmer about how they raise their chickens! You get to know the farm and farmer that your eggs are coming from, which connects you to your food in such a special way! This also reduces the environmental footprint of your food! now… the importance of being PASTURE RAISED! 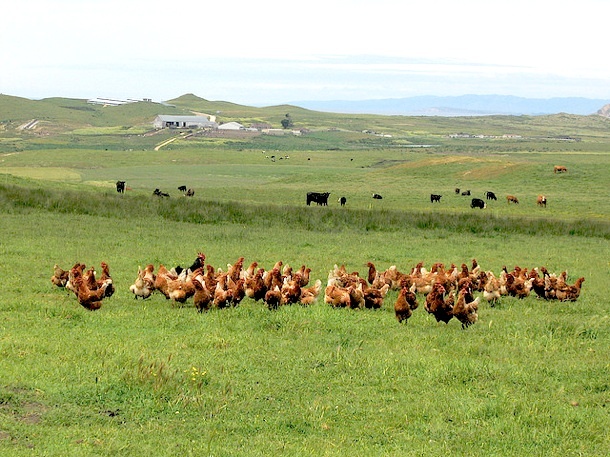 Pasture raised means that the chickens are raised the way nature intended, on a pasture. These hens are allowed to roam and play in the sunshine all day. They get to eat bugs and worms, which is the diet that they are meant to have! They take dirt baths and do all the things that chickens are meant to do! – Have 5 times more Vitamin D than normal store bought eggs! – Contain 2 to 3 times more Vitamin A than normal store bought eggs! – Provide 2 to 3 times more Omega-3 fatty acids than normal store bought eggs! – Have 3 times more Vitamin E than normal store bought eggs! – And, finally, 7 times more beta carotene than store bought eggs! – They also contain a third of the cholesterol and a 4th of the saturated fat that normal eggs do…so when you eat pasture raised, you can stop fearing the yolk! 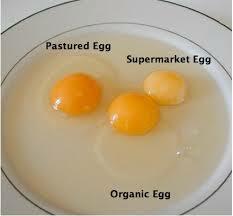 Eating the egg yolk provides a complete protein with essential fats and it is one of the best foods you can eat. In my opinion eggs are one of natures most perfect foods…definitely a superfood in my book! But what about organic eggs?! organic eggs are also “cage-free,” but this is not what you think it is. Cage free standards simply mean that the chickens are not enclosed in a cage and have access to the outdoors, but it doesn’t mean that they get outdoor time and aren’t cramped! These chickens are also not given antibiotics or hormones, which is GREAT! Except for the fact that these chickens are extremely sick due to poor living conditions. Farmers actually where hazmat gear to collect eggs…SCARY! So what does free range, free roaming, or cage free mean? There is no government regulation or definition for free-range or free roaming… in reality, it means nothing. These chickens are allowed to roam freely…meaning they are not in cages like typical hens. However, they are still held in cramped spaces where they can barely move around. These words are simply marketing tactics to entice you to buy eggs that are really no different than the other conventional eggs on the shelf. Cage free actually does have some industry standards that it has to follow. These chickens cannot be in ‘cages’ and must be allowed access to the outdoors, but there isn’t really a standard for what this means. Typically, these chickens are still crammed into a shelter with no windows. However, they must be allowed access outside, but this is usually an extremely short amount of time, if at all, and in an extremely confined space where the chickens can barely move. All of these chickens are also still subject to painful debeaking and the males are suffocated, ground up, or just left to die. These chickens may be given hormones, antibiotics, GMO feed, and other unnatural substances. All natural doesn’t have much of an industry standard, but products with these labels are supposed to be minimally processed and without artificial ingredients…how do you add artificial ingredients to an egg anyways?! This term has nothing to do with how the chickens are raised or in what conditions. 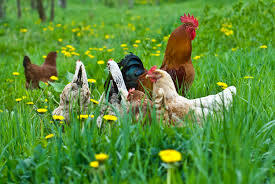 These hens are fed a diet that is supplemented with a source of omega-3 fatty acids, typically flax seeds. These eggs aren’t much different than your standard egg…and like I said above, by buying pasture raised you are getting 2-3 times for omega-3 fatty acids anyways! These chickens are raised in without access to perches, nest boxes, litter, or the outdoors. These chickens are given basically no room to move and their ability to perform their natural behavior has been completely removed. These chickens are fed feed with GMO (genetically modified organisms) such as soy and corn. These are not natural foods for a chicken to consume and can cause the chickens to become sick. These chickens are pumped with antibiotics because almost all of them are sick due to such poor living standards. These chickens are also given hormones to increase their maturation time and allow them to produce larger eggs more quickly. These chickens are debeaked and subject to other painful living conditions. CONCLUSION?!?! Pick the happy chickens like the ones in the pictures below! Support humane raising of chickens and your health! Not only are you able to support how chickens are raised, you are actually getting more benefits and nutrients out of the pasture raised chicken! Support your local farmers and community, your health, and the welfare of animals! BUY WITH INTENT! This entry was posted on January 24, 2014 by holisticrendezvous in learn!, Uncategorized and tagged breakfast, cage free, choices, eggs, fit, fitfluential, free range, healing, health, healthy, holistic rendezvous, holisticrendezvous, learn, organic, protein, teach, weightloss.